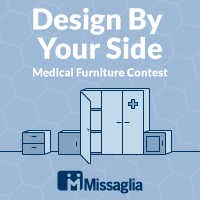 Missaglia relies on the international community of designers for a new product that puts the individual at the centre, suggesting a new series of cabinets (wardrobes and various-sizes containers) with an innovative design and a great care for detail, able to fit well with the various areas inside hospitals, nursing homes and private clinics. In line with the brand values, the cabinets shall have a special care for environmental issues and present themselves as highly innovative products, able to embed state-of-the-art technologies, both electronic and not (i.e. Internet-of-Things IoT, nanotechnologies, etc.) and be open to additive manufacturing technologies, able to ensure a high degree of customisation, especially in the making of accessories, details and components. Product typology: you are invited to propose a family of different-size cabinets (see Material files) to employ in medical environments, with an attention to innovation and a very refined design, specifically designed for improving the usability of the final user and capable of fitting well with the various settings inside the venues where they are employed, putting the individual and its needs at the centre. Keep into consideration that the various cabinets, once placed side by side, might give life to several compositions (see Material files for some examples). Functions: the cabinets you propose, in addition to performing the main function they are meant for - containing - shall have a special focus on safety, providing locking and/or access control solutions. Furthermore, with a view of giving maximum importance to the final user, they shall take care of the finest details for the user experience and their practicality to be moved. Ultimately, it is of the greatest importance that your solutions ensure the greatest ease of sanitization. 3. Containing medicines: this function will be used in the areas reserved to the medical and auxiliary personnel and shall allow for a practical storing and access to medicines. The solutions able to improve the medicines management, suggesting digital and technological solutions such as the monitoring of the availability and expiration date of the medicines will be appreciated. Keep into consideration that some medicines and drugs might require a temperature-controlled storage (see Material files for some examples). With the aim of performing all the various functions, the cabinets might use special accessories or be specifically equipped according to the use. You are free to employ graphics that may facilitate the use of the product (see Material files). Mobility: in order to facilitate the movement of the cabinets across the various areas of the venues, equip your projects with wheels and – so far as is possible – keep their weight and size at its minimum. Shape and size: avoid using sharp edges to guarantee the maximum safety of the final users. Avoid shapes and elements that may retain dirt, thus impairing the sanitization. The size shall comply with the standard for this product typology and shall allow for a practical movement of the cabinets across the various areas of the venues, passing through standard sized doors (90cm width x 210cm height). The solutions able to address also the needs of people on wheelchairs, with mobility impairments or using medical guards, etc. will be appreciated. Technologies: in order to allow for a better versatility and granting a better attention to the user, your cabinets shall be equipped for the interaction with electronic devices and ensure a possible development in the Internet-of-Things (IoT) scene, suggesting interactions, sensors and use scenarios. Materials and environmental compliance: the family of cabinets shall be designed with a special attention to environmental issues, opting for low-environmental impact materials, capable also of ensuring a practical sanitization, avoiding for example porous materials. The choice of the most apt materials will also contribute to reducing the emission of VOCs (Volatile Organic Compounds) inside the venues. You may also suggest the use of additive manufacturing technologies to ensure a greater degree of customisation for components and accessories. Materials containing formaldehyde or, in any event, not complying with the medical environment requisites are forbidden. Where to use: the cabinets will be employed in medical environments, including hospitals, clinics and nursery homes; they shall be versatile and suitable for being used in different areas inside the venues where are employed, from the entrance hall to the patient rooms and the work spaces reserved to personnel. Style: the cabinets you propose shall have an innovative and sober style, with a contemporary design, able to present themselves as technological products in line with the values of the Missaglia brand. Values to convey: the cabinets shall be able to convey the values of Missaglia, starting from their mission to work “ for the well-being and care of the individual in compliance with social and environmental sustainability ”, thus paying the due attention to all the aspects related to ease of use and user experience . Equally important the attention to convey the passion of the brand for the creation of Made in Italy products with a high degree of innovation, while maintaining a sober and simple style, with a very refined and functional design. Logo: the Missaglia logo, provided in the Material files , shall be present and visible on the various cabinets you suggest. Target: the cabinets will be employed in hospital and nursing venues, adapting to the various environments and shall mainly address the healthcare worker and patient. Deliverables: upload all the images that better present your projects (rendering, descriptions, CAD files, etc. ), preferably attaching the 3D files in .stp or .igs formats. If necessary, remember that you can also attach a .ZIP archive containing extra materials. Winner announcement:	approximately before the end of February 2018. Concept revision: deadline for requiring an optional revision on your project by the Desall team. In order to request a revision, save your project as draft and send your request via e-mail or through the contact form. The revision is NOT mandatory: it serves only as a further opportunity for the participants but does not constitute a condition for participation, nor does it constitute any advantage in the final evaluation. Participation is free of charge and open to designers and creative talents of any nationality aged 18 years or older. Participants can present one or more projects, but only the projects published on the www.desall.com web site, via the upload page related to “Design By Your Side” will be accepted. The selection of the winner by Missaglia will be the result of an unquestionable evaluation and it will take into account originality, feasibility and consistency with the brief presented. For the duration of the option right, the Sponsor offers an extra chance to all participants setting a price of Euro 1.500,00 (one-thousand-five-hundred/00) for the purchase of the license for the economical exploitation of the projects not-acknowledged as the winning proposals. Do you want to stay updated about "Design By Your Side"?